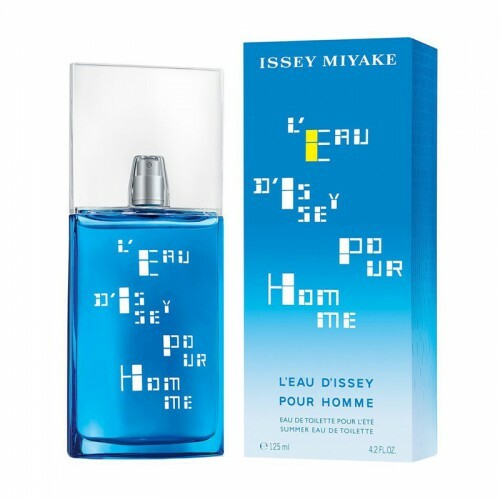 Issey Miyake L'Eau D'Issey Pour Homme Summer 2017 is created especially for you! Issey Miyake L'Eau D'Issey Pour Homme Summer 2017 125ml. EDT - Are you a true connoisseur of fresh, invigorating, defiantly open and natural smells? Then the magnificent aroma Issey Miyake L'eau D'issey Pour Homme Summer 2017 is created especially for you! Spicy sour of green kiwi fruit is successfully supplemented by the astringency of pink grapefruit. The spice of oriental coriander is harmoniously intertwined with the fruit motifs of sweet pineapple. Pleasant nutmeg looks great surrounded by wood motifs, which are represented by a fragrant vetiver and slender cypress. Warm summer days filled with sunshine, light sea breezes, romantic walks and interesting acquaintances are the best time to use the delicate, elegant fragrance of Issey Miyake L'eau D'issey Pour Homme Summer 2017, after which an unprecedented, inspiring aftertaste is preserved. Top notes: Coriander, Grapefruit and Kiwi; medium notes: Pineapple and Nutmeg; basic notes: Vetiver and Cypress.